Guardia Civil officers had a rather unusual call yesterday in Las Americas when a hotel employee reported a monkey was on the beach. They quickly swung into action and followed the monkey to an apartment complex where it was finally captured by their Nature Protection Unit. It was then transported to a local animal park where it will stay while investigations are carried out to locate its owner. 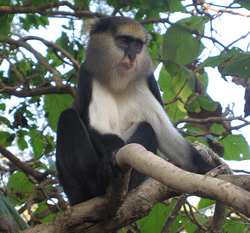 The African monkey, which is in very good health is a Cercophitecus Campbelli, or Campbell’s Monkey and it does not have the mandatory microchip which zoos are obliged to fit to their animals. Spanish Customs have been alerted in case the monkey has been imported illegally.